Maybe you’ve had people make fun of your love of productivity apps. Fear not; this is a safe space. (Haters gonna be—inefficient.) Some of my favorite productivity apps inhabit my Mac’s menu bar. Here are14 worthy of note. Not really a menu bar app, but it lives in my menu bar. Anyway…you’re using a password manager, right? Right? I’ve been using 1Password almost since it was a baby, and I can’t imagine life without it. It’s so much more than passwords, too: you can store important documents, notes, files, credit cards, IDs, etc. It generates passwords for you, and it warns you when there’s been a hack or one of your passwords is old or weak. It’s cross-platform, cross device, and supports TouchID on the Mac. Super duper. ColorSnapper is the best utility I’ve found for capturing colors anywhere onscreen. It copies color codes to your clipboard in any format you like, and stores them in a handy palette. Customizable keyboard shortcuts make grabbing colors a snap (sorry, couldn’t resist). This one-trick pony is handy if you’re concerned about making sure your designs meet the accessibility standards outlined in the WCAG 2.0, and provide sufficient contrast for all users. And I know you are! 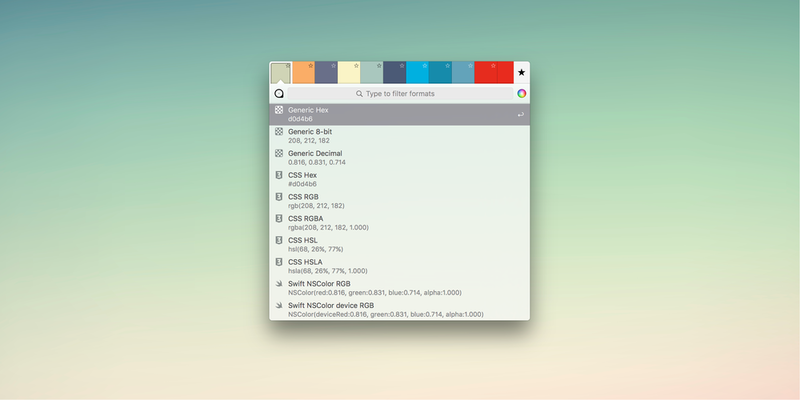 You can use the color picker anywhere on your screen, or enter color codes manually. Little big detail: the left picker sets the widget’s text color, while the right picker sets the widget’s background color. Neat. If your workflow includes Sketch + Invision, then Craft from Invision is a must-have plugin. A blurb can’t begin to do justice to all this hydra-like utility offers, so check it out for yourself. Note: like Alfred and 1Password, Craft’s menu bar widget is just a glorified preference pane, but worth knowing about. I’ve always kept a journal, and for the past several years, I’ve done so with DayOne. It has support for multiple journals (for me it’s Ideas, Projects, Family, Personal), a beautiful UI, and cross-device syncing…what’s not to love? 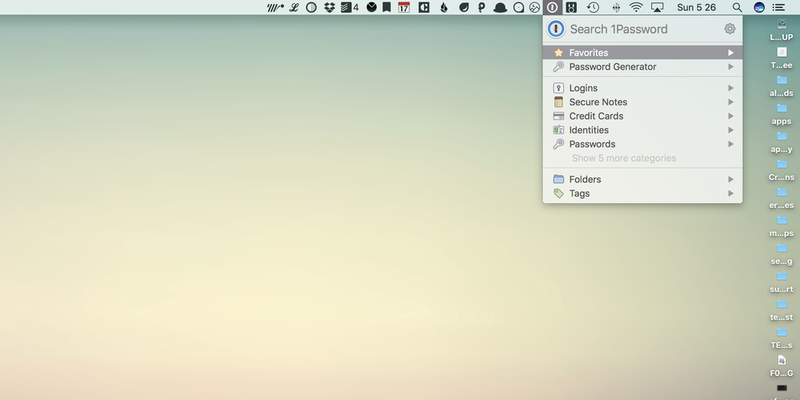 DayOne’s menu bar widget lets you make quick entries without bringing up the full app. 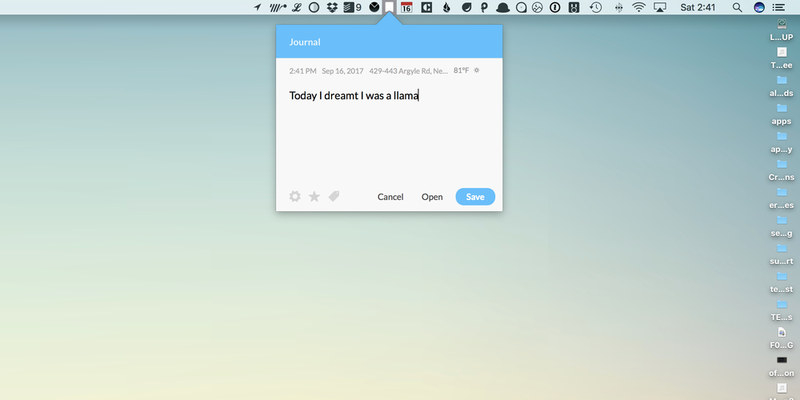 And, you can set DayOne to remind you to make entries; when you do, the menu bar widget opens automatically to guilt you, er, prompt you, into writing something. You’re probably thinking this is just another menu bar widget that doesn’t do much — and you’d mostly be right. Except that it’s a powerful shortcut for finding recent files. Much quicker than going to Finder anyway. I came late to the Droplr game. I wondered why people didn’t just stick files in Dropbox and share the link? But with TED’s corporate Droplr account, I had to give it a shot, and now I’m a convert. I’m Option-D’ing all over the place: in many apps and, of course, Finder, clicking Option-D uploads whatever you’ve selected automatically to Droplr, and generates a shareable URL that’s copied automatically to your clipboard. Multiple files are uploaded as an archive. On top of that, you can take and annotate screenshots, screencasts, and more. The menu bar widget offers shortcuts, as well as a recent history of items. Apple’s Calendar app shed its Pleather™ skin years ago, but it still can’t compete with the admittedly pricey Fantastical. Not only is it a gorgeous app, Fantastical is feature-packed, but in an intuitive way. Each update offers useful, thoughtful improvements. And unlike some of the other menu bar apps I’ve mentioned here, Fantastical’s menu bar app is actually a full-fledged, miniature version of the full Fantastical app. You can search for or add events and reminders, and (natch) view your calendar. The menu bar window can be detached, and you can set it to float above other windows so it’s always present. I often use it instead of the full app, in fact. Every decent designer knows you never, ever design until you have actual copy. HAHAHA-OMG-ROTFL-LMAO! Whew, that was fun! Anyway. For those times when you have to design without real copy, LittleIpsum is quite handy. It generates any amount of copy you want — specify number of words, sentences, or paragraphs — and it copies a plain text version right to your clipboard. This one-trick-pony rocks. Noizio is my favorite white noise app. It’s fun to mix your own ambient sounds. I mean, Deep Space + On The Farm + Coffee House? Sailing Yacht + Campfire? Oh, and there’s an iOS version, too. I really shouldn’t include Paste in a write-up of menu bar apps because its widget really does nothing more than get you to its preferences. But damn, do I love Paste. It’s by far the best and most beautiful clipboard manager I’ve used. Paste has a customizable history; entries are stored in a very visual format; they can be filed for future reference; and it supports iCloud sync so you can access your history across devices. The only thing missing is a mobile version — and the developer says that’s in the works! Pixelwinch is a gem. Capture any portion of your screen and make pixel-perfect measurements of even the smallest interface elements. It stores a history of recent clippings, too. Update—19 Feb, 2018: Add another amazing screen measurement tool to my menubar arsenal: PixelSnap. Invoked by a system-wide hotkey, you can drag a marquee around anything on your screen (yes, anything), and PixelSnap will return the measurements instantly. It does a fantastic job finding boundaries, but you can adjust the settings if you like. It’s like magic! I find myself invoking PixelSnap more often than Pixel Winch, above, but one feature I like about Pixel Winch is its clipboard history. Caveat: PixelSnap isn’t cheap. Thanks for the tip, Steve. You can set your menu bar to hidden. I have, and I love it: more screen! If your menu bar becomes overpopulated, try Bartender, a handy little utility that lets you show or hide apps as you like. So, what’s in your menu bar? I’d love to know. How I found our newest engineer on an airplane. I was flying back to NYC from our semiannual tech summit where one of the hot topics was resourcing and, in particular, our need for talented front-end engineers. At the same time, I was wracking my brain on a project, trying to identify all the potential states for one of our Web apps. I decided to take a break and catch up on some reading when I came across a piece on Medium titled The Nine States of Design. Thoughtful, relevant, and written with a dash of humor—that’s how I’d describe it. Bonus: it helped me think through the aforementioned challenge, and it showed great respect for the user (be still, my beating heart). When I discovered the author, Vince Speelman, was a front-end engineer with UX chops, my heart beat a little quicker. I did some online stalking—I still marvel at surfing in the clouds—and the results were promising. I shot him an email asking if he was interested in the possibilty of joining TED. He responded a few minutes later, and before my plane touched down at JFK, we’d arranged a phone call. I didn’t get the sense that Vince posted his piece in order to land a gig, but the quailty of his insights and willingness to share them freely is why I connected with him. Everything fell into place after that initial phone call, and I’m thrilled that Vince will be joining our Tech Team as a front-end engineer in March. Be generous with your knowledge. Good things can happen. And if you’re hiring, don’t just look for good profiles—look for good thinking. Originally published at Medium on February 2, 2016. Egoless UX is the right way to do UX. It's so obvious it's a cliche, but it can be hard to put into practice; I struggle with it myself even though I experience the benefits of an egoless UX practice every day. Egoless UX means you're the ultimate collaborator with your team, your organization, and each of your users. It means giving up ownership of the work — which wasn't really yours to begin with — and instead becoming its most ardent champion. It means being willing to fix things that don't seem broken. It means pushing back not when you think you're right, but when you can prove you're right. Most of all, it means not taking your work — or feedback about it — personally. You're not a fine artist, and your work is not you. Try it. Get feedback and criticism from all quarters. Take it in, hear it, evaluate it, and act on it. The sting of criticism will be bearable when you see how much better your work is because of it. In fact, egoless UX is downright liberating.